Yesterday there was an article in the paper ‘Why I’ve ditched my anti-cholesterol drugs for good‘ where Haroun Gajraj (a vascular surgeon) has lowered his cholesterol levels from terrible to good. He got rid of the sugar in his diet and started eating animal fat, after a University of Cambridge study showed that saturated fat is ok now (or at least that no link between it and heart disease was shown, obviously more research is needed, perhaps there’s a teeny tiny effect that could be spotted if you only studied more people). This is interesting as it was pointed out to me as news, even though Gary Taubes described this in his 2007 book The Diet Delusion which I read last June. A 460 page summary of all the research over the last 150 years (not including notes). But the information is not real until it is in the papers. Here we can see that sugar consumption in England and Wales (dotted line) ranged from 65ish to 100ish pounds/person/year and it was almost perfectly tracked by diabetes deaths (black line). I know it’s obvious now but at the time they though diabetes was caused by high fat and the treatment was low fat, high carb diet, they didn’t pay attention to this graph and the attendant data. Fortunately access to insulin and the invention of antibiotics to treat side effects of insulin after the war, started to break up this particular correlation. This ties in to Keyes’ Seven Countries study of heart disease, which invented the idea of the Mediteranian diet due to the health of the islanders of Crete and Corfu, and noted the health of the Japanese. The Islanders were getting less than 16 pounds of sugar and no white bread (off the bottom of this chart) and the low fat Japense diet was equally low sugar, less than 40pounds/person/year in 1963 and still under 50pounds/person/year in 1980. Contrast that with England and Wales when, at the height of sugar rationing, we never ate less than 60pounds/person/year, and the US in 2008 weighed in with 133.7pounds/person/year. 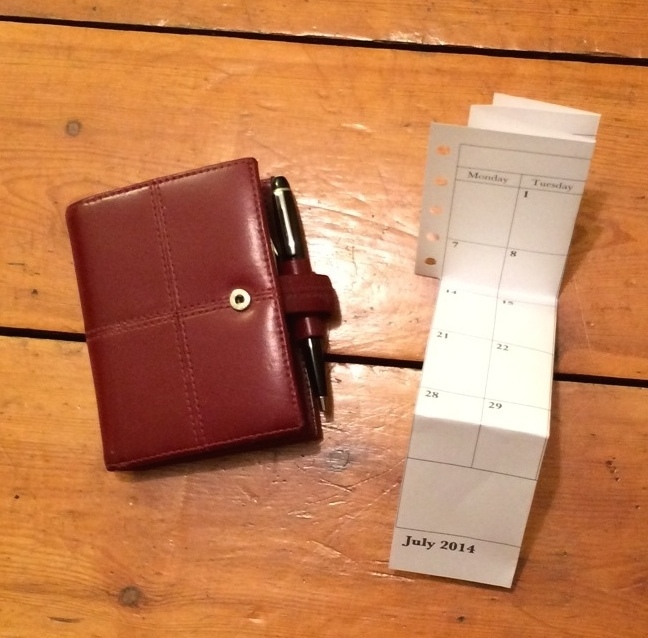 Some time after getting my much coveted red mini filofax, I found I was hardly ever using it, and that I had made up a month-to-view piece of paper that I was carrying around, getting more and more bedraggled as the month went by. 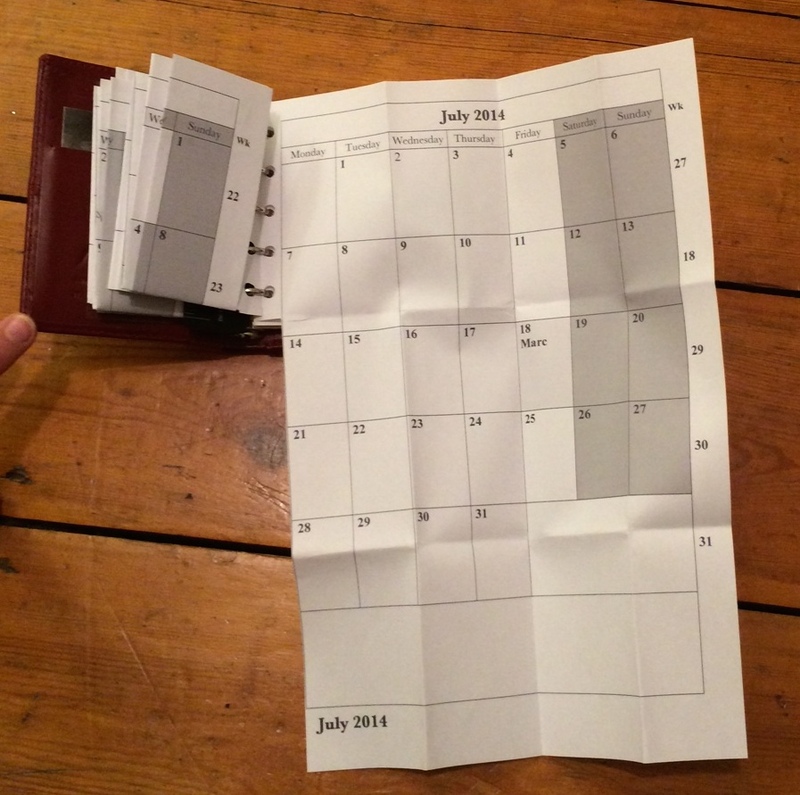 In stroke of genius I put the two together to get fold out monthly pages. 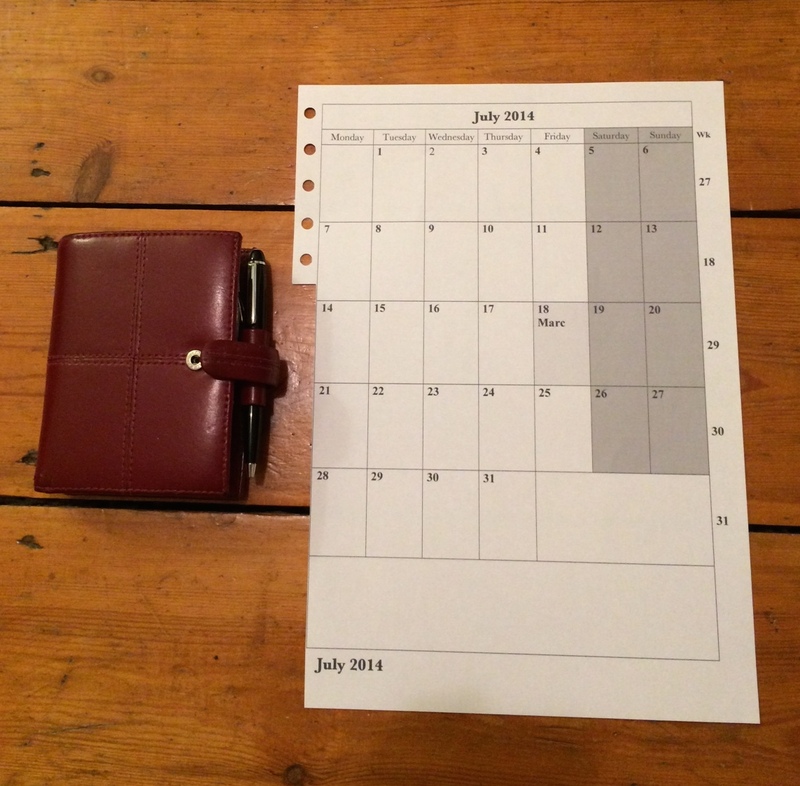 The only downside is that ordinary printer paper is thicker than the filofax inserts, and by folding the months in four and then in three, I effectively use 12 pages per month. So I can only keep about 3-4 months at a time. After printing, cutting out and hole punching, after folding vertically, after folding horizontally and as it is in use. The template is here and for the rest of this year I have April, May, June, July, August, September, October, November and December. This post was brought to you by ImageOptim, and the letter lets-not-include-my-GPS-data-in-the-photos. What do we need for a rehabilitation culture? Today I was at the RSA talk Creating a Rehabilitation Culture. Rachel O’Brien chaired and Shadd Maruna spoke. In Shadd’s history of changing attitudes to rehabilitation I was struck by the idea that the seminal paper in the 70s that suggested ‘nothing works’ vs the ’12 disciples’ whose scientific work showed that rehabilitation ‘does work!’ and allowed a renaissance in the idea of rehabilitation, were presented, not as causes of the change in attitude, but symptoms of a larger societal change. What might have actually caused this change was left open. Connie Willis devoted an entire novel to this question. If only we could find the hidden influence (we have met the enemy and he is us?). Shadd also drew on the familiar Spirit Level graph pointing out that the link between relative deprivation and crime can be a two way street. While more unequal countries have more people in prisons, going to prison also makes you poor. (The US is an outlier as its prison population is even higher than you’d expect given their inequality, while Greece has a much smaller prison population than expected compared with all other developed countries). A third point discussed how imprisonment can be considered an act of violence towards the imprisoned, meeting violence with further violence. Shadd suggested, that the question that was ‘answered’ by prison was not a meaningless question, but a loaded question. That by asking the wrong question we get an answer (prison) that is the right answer to that question but not right overall. The worrying idea of performance related pay for outsourced rehabilitation services came up in the questions This has never been show to work in any creative job (maybe rote work), instead it encourages people to game the system, rather than care about their work from intrinsic motivation. Alfie Kohn discusses this in Punished by Rewards. Author christinedelonPosted on 24 March 2014 Categories Uncategorized1 Comment on What do we need for a rehabilitation culture? I’ve just been reading Sherry Turkle‘s book Alone Together, why we expect more from technology and less from each other. It’s a good contrast with Jane McGonigal‘s Reality is Broken. The latter is all about how games can bring out the best in us, the former about how technology is not a universal panacea (Ok those two things are quite separate, I could have drawn a description that would have depicted the two positions as complete opposites but I didn’t). A robot would cook me a proper dinner and not give me cereal for supper. Speaking of robots that will exist sooner, to look after elderly people, Sherry pointed out that we seem to be starting from the assumption that, even with unemployment through the roof, we will not have the time and resources to have people looking after older people, so we should give them robot companions and robot nurses. But as Sherry quotes Apppiah: the options are shaped by the question, we need to challenge which question is posed and ask what care we want to provide. Here are all the Islington library opening hours in a simple matrix so you can quickly see which libraries are open at any given time. Can’t wait for amazon to post your new must read book (DVD, CD)? See which library has it and go to the one that’s open. With at least four libraries open into the evening each week, work needn’t get in the way of reading. You can also login and order books to be waiting for you at your nearest library. The only thing missing is a Netflix setup. Ideally I would have a list of all the books I want to read in my account and they would send them to me one at a time as I return the previous one. I think I should point out that far from being paid by Islington for this endorsement, I pay them. I’ve sized this print out to fit into a filofax mini. 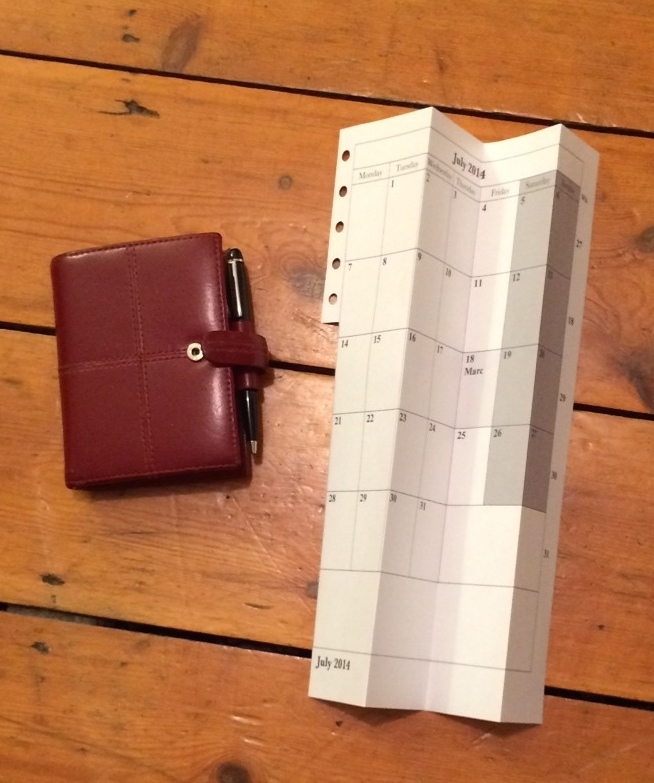 The mini has almost no accessories so I’m reduced to DIY inserts (though filofax probably doesn’t publish Islington opening hours in any size). Further to my list of favourite daily webcomics: I love reading The Order of the Stick, by Rich Burlew. Its’ amazing how expressive stick figures are. This is an good illustration for my argument against HD, the story is far more important than the resolution of the picture. The current book has just ended, on quite a dramatic note (well nobody ends on a boring note). There are always lots of references to pop culture (the banana muffin shaped hole on the belly of the dragon) as well as actual culture (but what if I don’t want to fight in the shade?) My favourite is the resolution of the old classic ‘there are two paths one guarded by a custodian that always lies and the other by a custodian who always tells the truth’. Turns out if you shoot one of them in the foot, their swearing will enable you to figure it out pretty quickly. The kickstarter event back in 2012 was also great fun. With an initial goal of $60,000, the Kickstarter ended on $1.2 MILLION, with new graphs every day or two telling their own story. Turns out that working hard every day for 9 years will bring you overnight success.